Generating ideas is the fun (and frankly, easiest) part of innovation. The true challenge is prioritizing to find the ones that are equal parts desirable, feasible and viable. We’ve got a tool for that. This is the first in a multipart series on the Roadblocks to Innovation—where we’ll be providing real-world examples, actionable insights and practical tools that can help you innovate to win. Read part two here. We’ve all been there: staring at the hard-earned fruits of a productive ideation session, wondering what to do next. You have the critical task of sorting through the haystack of ideas, in search of the ones that are appealing, doable and results oriented. You have the task of prioritization. More than creativity, empathy, ideas or technology, innovation success is the art and science of making choices. When I talk to my colleagues and friends in the industry, the roadblock cited most often is “a lack of time and resources.” Unfortunately, there will always be more good ideas than resources to pursue them. Therefore, your team’s success hinges on the ability to correctly prioritize the greatest ideas, then allocate the proper resources. LPK’s leading clients have increased their odds of innovation success by balancing deductive analysis with creative intuition when prioritizing ideas. The task of prioritizing your ideas starts before your team generates a mountain of them. It’s critical to align to a crystal-clear objective and an innovation strategy early on. These guardrails help create focus when ideating, ensuring that the ideas created are relevant to consumers and actionable for your business. Innovation is a team sport. That means multidisciplinary collaboration—not just when ideating, but also while prioritizing. Before scoring, your expert prioritization team must create its prioritization criteria together—it guarantees a more balanced, holistic evaluation. While a project may require its own unique criteria, three categories can neatly organize most any set of measures. We’ve populated the three categories with our most common criteria—available for your use in our downloadable Prioritization Scorecard & Matrix. Appeal & Relevance: Is the idea appealing and does it answer an evident unmet need? Ease of Use: To what degree is this idea easily used by consumers? Anticipated Intent to Purchase: Do consumers anticipate or demonstrate an intent to purchase and adopt the idea? Revenue Potential: How large are the estimated addressable market and size of prize? Strategic Fit: Is the idea aligned to the brand architecture and enterprise strategy? Differentiated & Ownable: Does the idea create a competitive advantage that can be owned and defended by the brand? Speed to Test & Launch: Can the idea be tested and delivered at scale within the agreed-upon timetable? Affordability to Test & Launch: Can the idea be tested and delivered at scale with reasonable capital expenditure? Technical & Operational Feasibility: Does your organization have access to the required technical and operational capabilities and partnerships to execute the idea at scale? Prior to scoring the ideas, it is critical to aggregate all ideas in a common format. Once the Prioritization Team has gathered, the ideas are rapidly reviewed for clarity and the criteria are confirmed. Participants individually score each idea using the provided Prioritization Scorecard & Matrix so as to avoid groupthink. 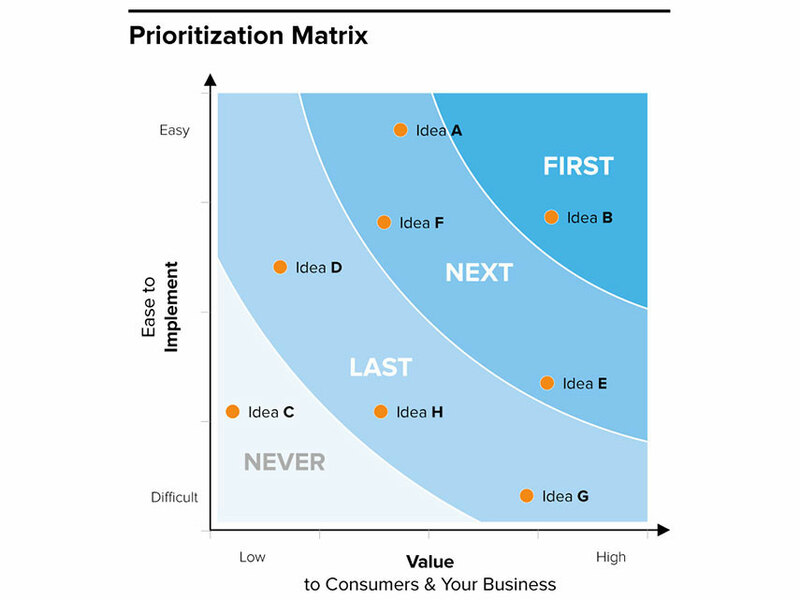 But a word of caution: while the Prioritization Scorecard & Matrix provides a satisfyingly simple and definitive recommendation of prioritization, rigorous analysis should be balanced with intuition. This process exists to guide teams through evaluating ideas using their best assumptions and shouldn’t take the place of engaged debate and decision making. For example, at a recent prioritization session, a much-beloved idea found itself ranked near the bottom when formally evaluated. This sort of dissonance requires a deeper review and conversation. The mystery of our admired, but bottom-dwelling idea? While it undoubtedly answered a consumer need, the anticipated capital required and time to launch outweighed the estimated reward. With a clear objective, the right criteria, expert evaluators and a bit of intuition, you’ll come away with a bank of high-potential ideas. Interested in learning more about how LPK powers through indecision and inaction and accelerates ideas to market? Drop Nick a line at nick.partridge@lpk.com.